Need batteries? Today (10/10) only save up to 73% off retail price on Sony Battery packs! Multiple voltages available. 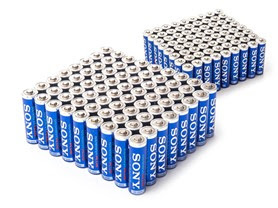 I am grabbing this Sony AA STAMINA PLUS Alkaline Batteries - 72 Pack for only $18.99 (Retail $69.99). Perfect for those holiday gifts!